What’s more American than baseball and apple pie? The Ford F-150 certainly comes to mind. After all, the F-series simply exemplifies the American truck. And even after 70 years of production, the F-series continues to impress. For 2019, the Ford F-150 Limited is back and better than ever with some of the best luxury you’ll ever find in a pickup. So, hop inside and see what’s in store for this legendary truck trim. This year, Ford went all out for new features for the F-150 Limited. For starters, you’ll now get 75 more horsepower and 40 lb-ft more torque from last year’s model. Making it stronger than ever before! Hop inside the 2019 Ford F-150 limited for an all-new two-tone soft touch Camel Back leather option. And don’t forget to check out the extra ventilation holes in the seating. Even on the hottest of days, these seats will remain cool and comfortable! And for an added stylish touch, you’ll get your Ford truck’s serial number laser-etched into the armrest. It’s definitely - a great reminder that your Ford limited is almost as unique as you! And lastly, the 2019 F-150 limited received some nice cosmetic upgrades to its exterior. Some of the more noticeable features include a new rear bumper design. And integrated into this bumper is an all-new dual exhaust system for improved performance. This year’s Ford F-150 limited is packing some Raptor-tier power under its hood. To be exact, you’re getting a legendary 3.5-liter EcoBoost V6. Overall, this motor produces a respectable 450 horsepower and 510 lb-ft torque. So, you’re getting a 0-60 mph time here ranking around 5.1 seconds. You won’t find another light duty truck on the market with this level of power! Even amongst Ford trucks, this is impressive. 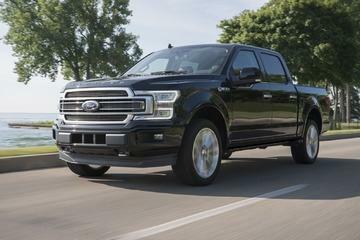 On the outside, the new 2019 Ford F-150 boasts a powerful design. But inside that exterior lies a suite of luxury. Quite possibly the most luxurious pickup ever. For starters, the front seat offers all the comfort features a driver could ever want. You’ll get everything from massaging seats to a heated steering wheel. Plus, you’ll even get heated and cooled front seats to meet the demands of any season. As far as cool features go, you’ll get some epic entertainment value with the Sync 3. This even includes a 360-degree camera system and Apple CarPlay and Android Auto. Go ahead, feel free to connect with your smartphone if you desire. And lastly, you’ll get all the safety features you could ever want. Automatic emergency braking, pre-collision assist, and adaptive cruise control are just the start of the list. In other words, this Ford truck excels at preventing any negligent accidents. According to Ford, you can pick up your 2019 Ford F-150 Limited at the end of the year. And you can bet Southern California Ford Dealers will be the first to let you know when it releases. So, stay tuned and we’ll direct you to the nearest showroom with next year’s highly anticipated F-150 model to come!